Brown bear facts about its widespread distribution show an individual population in different parts of the world. These animals are known to live in Great Plains, Mexico, Atlas Mountains, Morocco, France, Spain, Galicia, Asturias, Romania, Bulgaria, Slovakia, Sweden, Slovenia, and Greece. There are about 4,500 – 5,000 bears existing in Romania, with smaller animals subsiding in Ukraine (200 bears); in Northern Europe the population is around 2,500, 1,600in Finland, in Estonia there are 700 species. 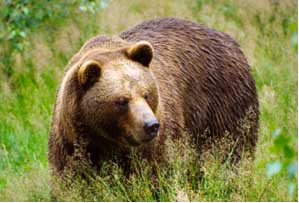 Other places in which brown bears are found include Serbia, Albania, Asia, Macedonia, Bulgaria, Croatia, Italy, and Bosnia. Brown bears predominantly feed on sprouts, plants, roots, fish, insects, mammals, and fungi. They also consume a lot of moths in a day. One of the favorite feeds of these animals is salmon fish. 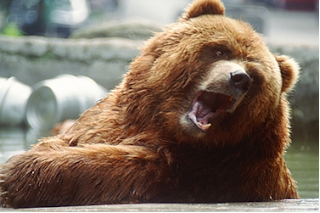 Brown bear facts regarding its diet include varieties of preys. These animals are also known to eat deer, moose, elk, mountain goats, bighorn sheep, bison, and muskoxen. 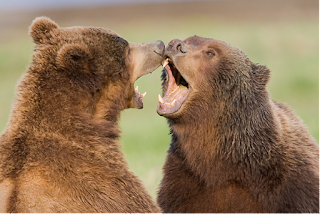 Brown bears also consume wolves, tigers, and cougars.